Outreach Chicago is a faith-based,Veteran led organization that began in 2009 addressing the needs of the homeless in Chicago. Over time our clients base has grown. Currently, our services are geared toward providing help to anyone who lack the resources to sustain a good quality of life. Our mission is necessities. 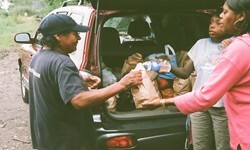 We provide food, clothing and personal hygiene items to low-income, homeless or near homeless veterans, individuals and families; we empower them to reintegrate into society and improve their quality of life with intervention resources and literacy programs; and we alert the world of its impact on their wellbeing. We realize homelessness is due to factors such as mental, physical, sexual abuse,and a lack of financial resources. Support non-profit ideas and organizations that will aid people in need. Assist low-income, homeless or near homeless individuals, families and veterans in regaining their quality of life. Distribute food, clothing and personal hygiene products to individuals living on the streets, in cars and abandon buildings. Provide young individuals with the tools necessary for stability and safety. Help homeless individuals, families and veterans reintegrate themselves into society through self-empowerment tools and computer literacy. Provide services to individuals, who are weary of the shelter system. This program provides bag lunches for homeless and low-income, individuals, and families. Personal hygiene items: women and men hygiene products, feminine products, feminine cleansing cloths, pampers, and baby wipes. Provides food and personal hygiene products and clothing for homeless veterans. Provides school supplies for low-income and homeless students. provides baby diapers, baby wipes, feminine hygiene products and toiletries to homeless and low-income individuals. New or lightly worn recently cleaned used coats, gloves, sweaters, socks, underwear, blankets, sleeping blankets.